There are seminal moments in one’s life where you always remember where you were when you received news of great import. The death of the great Muhammad Ali will remain as one for me. Bizarrely, but somewhat fittingly, as I pen this I am sitting beside a waterhole in Africa having just been floored by the news of his passing. It was on the African continent that Ali fought what was perhaps his most famous bout, the ‘Rumble in the Jungle’, against the formidable George Foreman. In the total tranquillity of the African bush it is not difficult to feel a sense of loss. For me Ali, like for so many, was a somewhat mythical figure. In his prime he was reputedly the most famous face on the planet. On his various trips to Africa people lined the streets, at time five deep, to get a glimpse of the man who rose above his sport. I never met Ali, but I was luckily enough to be touched by the power of his aura. It happened one day in September 2000 while I was covering the Sydney Olympics for the ABC. I was in the International Broadcast Centre at the time when a colleague burst through the door to inform several of us that Ali was in the building. Myself and my ABC colleagues hastily went out into the main corridor of the thralling building that was home to the world’s electronic media for the duration of the Games. Ali was being driven down the broad corridor on a golf cart, destined for the master control area that was responsible for co-ordinating the various video feeds from the myriad sporting venues around Sydney. Ali, as an ambassador for the Games, was on his way to personally thank the staff for their efforts. As he made his way through the building various doors along the way opened, pouring out representatives from media outlets from around the globe. Ali bore the mask of those significantly afflicted with Parkinson’s Disease – expressionless and deadpan. Yet there was an unmistakeable glint in his eyes, one that both betrayed a mischievous side and the sheer joy of being the centre of attention as he was throughout his adult life. As he passed by he was shadow boxing with his imposing fists, throwing gentle left and rights with hands that clearly trembled with the affliction he had been cruelly dealt. He drove past a veritable United Nations of world media, passing people of all colours and creeds. Some were clapping, others chanting “The Greatest’, while some just stood there with mouth agape as if witnessing something beyond normal comprehension. I reflected later that day as to whether any other person could have had such an impact on seasoned sports journalists. It is doubtful that anyone else could have mobilized such a frenzy. It was simply a sign of the standing in which Ali was held. Like no man before or him, or dare I say, after him he transcended the sporting firmament. He was a man of his era – an era that abounded in civil rights; the rise of the black man; and the nascence of the live televising of international sporting events. His bouts against the likes of Foreman and his trilogy against ‘Smoking’ Joe Frazier were beamed free into households around the world. It was an era when heavyweight boxing captured the minds of hundreds of millions. Ali was often a polarizing figure, particularly in the early years of his career. His conversion to Islam and his stance on the Vietnam War did not sit well with many. However, over time, he outgrew those issues and became embraced as a larger than life individual. He was as famous for his poetry and one-liners as he was for his flailing fists. Many will debate where he stands in the pantheon of his sport with respect to his ring craft and successes. One thing I unquestionable – no heavyweight ever moved with the grace and speed of Ali. By sheer personality, he was simply head and shoulders above them all. Whereas today elite sportspeople are insulated within carefully crafted bubbles, Ali was a man of the people. As he prepared to take on some of the most fearsome men his sport has witnessed his training camp at Deer Lake was open to one and all. You could simply walk in and watch Ali spar, pound the heavy bag or hone his innate skills on the speed ball. You would often be an audience for his ever busy mouth and mind. Following his retirement, he lived in Berrien Springs, a small town not far from Notre Dame University in Michigan. His home, often to the chagrin of his wife Lonnie, had an open door policy. Uni students would drive to see him and be welcomed with opened arms. He was known for performing magic tricks in his lounge room for his myriad uninvited guests. He lived a life that would be foreign to any other sportsperson of today, many of whom carry reputations that are mere footnotes compared to the man who proclaimed himself, ‘The Greatest’. 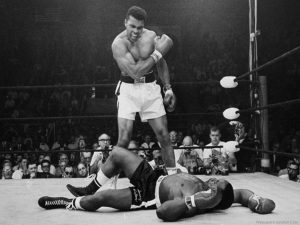 With the passing of Ali the world has lost a behemoth. We will never see the likes of him again.